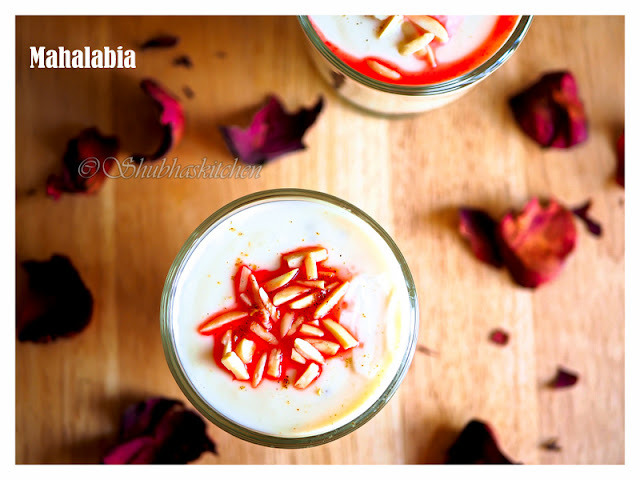 Mahalabia ,a Middle Eastern Dessert, is very easy to prepare and is very delicious. It makes a great dessert for parties as it looks very pretty and can be prepared well in advance. 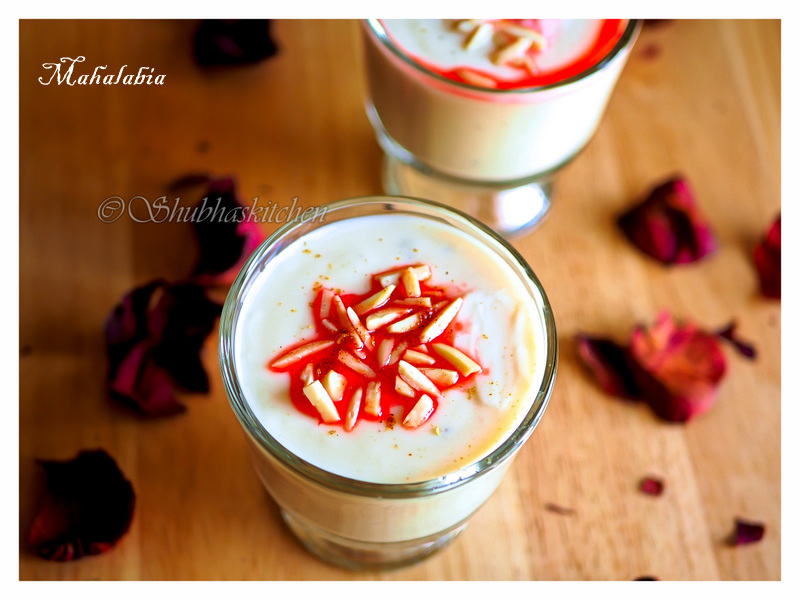 Mahalabia is a creamy, slightly sweetened milk based dessert. 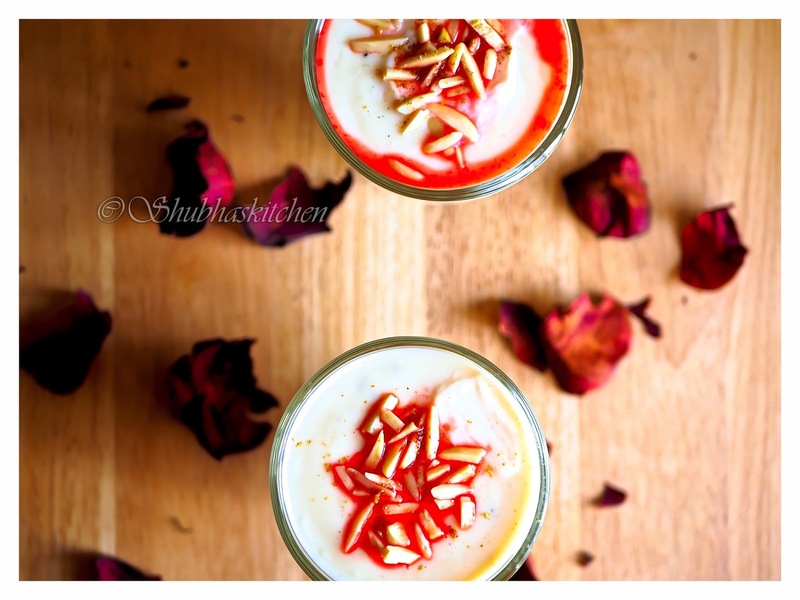 It is flavored with rose water and cardamom. Serve it chilled garnished with slivered almonds, pistachios and diluted rose syrup. After entering the world of food blogging, I have met so many talented food bloggers from all over the world and it has introduced me to so many world cuisines. One such talented food blogger and friend is Azlin Bloor who blogs at Linsfood.com. All her recipes are brilliant. Couple of months back , I saw this recipe on her blog and I was determined to try it at home. 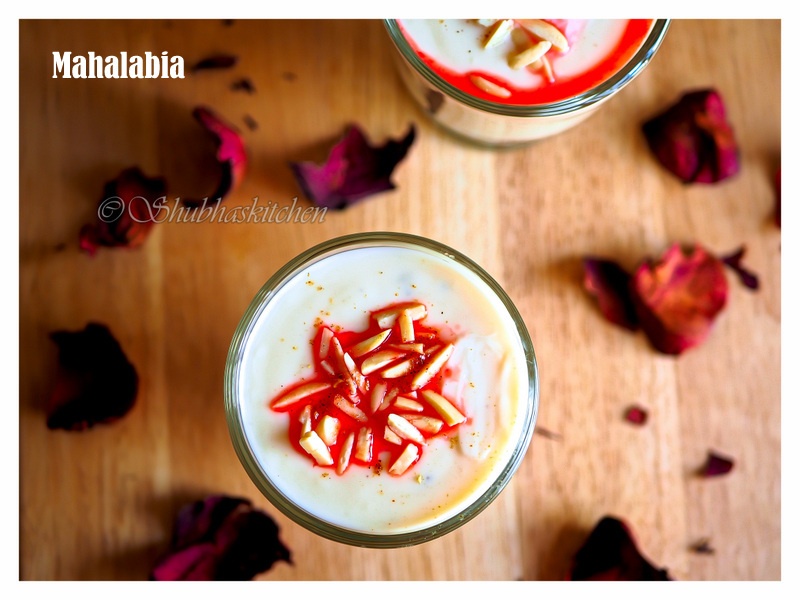 Yesterday, I did prepare this delicious dessert MAHALABIA. I exactly followed her recipe. This dessert is so creamy and has custard like texture. You can prepare this pudding well in advance and set to cool in mini dessert cups. With such a beautiful appearance , it sure makes a great party dessert. Many of my readers have asked me "What is evaporated milk?? Is it the same as condensed milk?" Well, evaporated milk and condensed milk are different.Evaporated milk has no added sugar. Its just the milk out of which 60 percent of water has been removed or evaporated.So its basically unsweetened reduced milk.You can learn more about in here . Here in the US, I use evaporated milk (comes in a can) by Nestle Carnation.You can also make evaporated milk at home.. To produce 1 cup of evaporated milk, simmer 2 1/4 cups of regular milk down until it becomes 1 cup. Mix the corn flour with 1/4 cup of milk. Set it aside. Mix whole milk and evaporated milk in a deep thick bottomed pan / pot. Also add sugar to it. Bring it to a boil over medium heat, stirring occasionally. As milk starts to boil, it starts rising up. Reduce the heat to low at that point. Add the cardamom powder. Mix. Slowly add the corn flour - milk mixture. Keep stirring continuously so that milk doesn't stick to the bottom. Keep stirring for a couple of minutes, it starts to thicken in to a custard like consistency. Turn off the heat. Pour it into individual mini dessert cups . Cover them and set it aside to cool for atleast a couple of hours. The pudding will start to set (thicken) once cold. 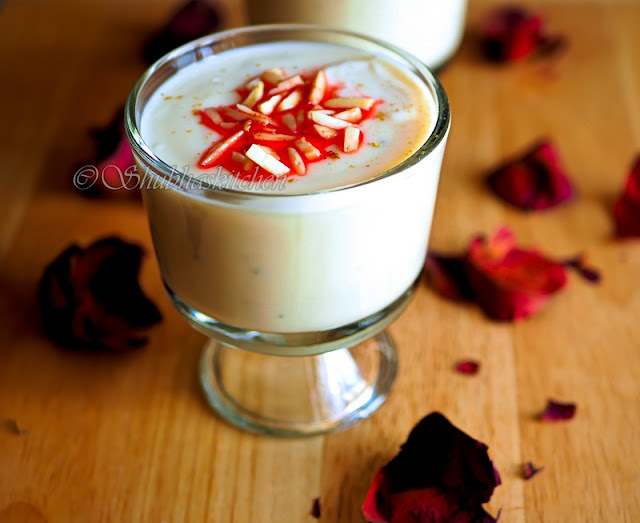 Serve chilled garnished with nuts ( almonds, pistachios) and drizzled with diluted rose syrup. * If you don't have rose water, you may use 1 tsp of rose essence. ** You can also sprinkle some EVEREST MILK MASALA on the dessert cups before serving. ***You can also sprinkle some dried rose petals for garnish. So tempting, Can't take my eyes off the glass. Yummmy. What a gorgeous looking dessert...I'm hooked to the glass! !